Thought I was kidding about the broccoli, didn’t you? We were just finishing up the CSA box broccoli explosion when another one came right after it. There was less broccoli in this box, but still rather a lot. Good thing it’s one of our favorite veggies. 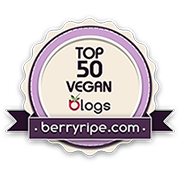 I’ve been on a bit of a blackened tofu kick lately – it’s easy (no marinating! ), spicy and yummy. There are two recipes I use – this one and the one from Appetite for Reduction. They’re both very similar, but this one is pan-fried in a little sesame oil and the AFR recipe is broiled. I always press the tofu before I make either of these recipes; I just prefer the texture of it that way. 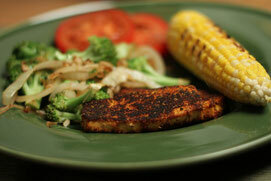 I don’t know – blackened tofu with veggies and corn just feels summery and light to me. While corn isn’t at the height of the season, it’s really good already so we’ll be eating a lot of it in the coming months. I can’t wait for it to be in our CSA! We just pop it in the grill pan and let it go. The broccoli was really easy too - I did with it was to steam fry it in a little bit of water, then added sliced onions, which we got from the farm for the first time. I also threw in some minced garlic for good measure and sprinkled it lightly with salt.